Surely Baby Born's coolest accessory - So Why Not Hit the road with the Baby Born Remote Control Quad. 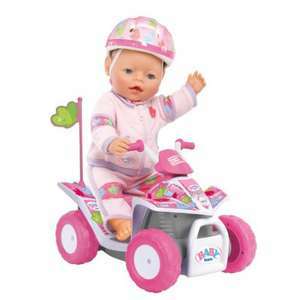 Pretty, pink and definitely the coolest way to travel, this remote control quad bike is the perfect accessory for your Baby Born doll (sold separately). It has an easy to use remote control and a harness to keep your doll safe.